This is the one. And it’s finally here. Rumours of the Block cylinders have been rife over the years but it’s only now, in these three packed CDs that we can finally hear what has caused such excitement and controversy. But back to the beginning. At the same time as Brahms recorded his Hungarian Dance in 1889 for Theo Wangemann who was making a celebrated series of - mostly lost - cylinders, businessman Julius Block was doing the same in Russia. His ambition was to record Anton Rubinstein but despite getting temptingly close Rubinstein remained obstinate. Others however proved more amenable. Included in this set therefore are the earliest recordings ever made of music by Bach, Wagner, Chopin, Schumann, Donizetti, Bizet, Tchaikovsky, Verdi and Arensky amongst others. What’s more we can hear Arensky, Taneyev, Paul Juon and Leo Conus play their own compositions. Major Creator recordings are here. Major composers. Major instrumentalists. The earliest cylinder dates from 1890 and the last Russian cylinder followed in 1898. Thereafter there are German-made recordings of 1912-15 and some made in Vevey in Switzerland in the 1920s. I should add here, unbelievable though it may sound, that an 1890 Moscow cylinder captures Tchaikovsky talking with Anton Rubinstein and Safonov, though there are mysteries surrounding this cylinder that are set out in the beautiful and extensive booklet. Block, himself a decent pianist, certainly recognised the historical value of his vast collection of cylinders. He tried to interest Edison, who remained indifferent. His family ensu#000080 though that a large part of the collection went to the Phonogramm-Archive in Berlin on his death; some went to Warsaw where they seem not to have survived. Thus we have lost examples of Leopold Auer and cellist Joseph Press as well as the Tchaikovsky trio played by Taneyev, Hřímalý and Brandukov in preparation for a visit by the composer, to whom Block played the recording, in November 1891. Many of the Berlin cylinders survived the war and were confiscated by the Russians in 1945 and taken to Pushkin House in Leningrad. An early 1990s auction of some Block cylinders led to a resurgence of interest in them. In 2002 the bulk of the cylinders became public knowledge. Hence this boxed set. The tracklist doesn’t quite conform to standard house style for the very good reason that this is an artist-led project of such historical magnitude that all eyes will be on them, many of whom never lived to record commercially. I think it goes without saying that this is one of the most important historic sets ever to have been issued. Due to the age and fragility of the cylinders and due to the fact that a couple have been transferred from an inferior cassette copy because the original was in the hands of a private collector - a Pabst and the sole choral piece - the sound ranges from decidedly bearable to exceptionally tough listening. Once the ear attunes, and even better if one listens through headphones, then things become easier still. Fortunately Ward Marston has ensured that the sound is brought forward in a way familiar from his established practice though here work was very much more problematic and time-consuming. I’m personally cheered that, for some of the cylinders, he employed the services of Dimitrios Antsos, who has perfected pitch-correction miracles before now – one thinks of his early Paris piano sessions work for instance. The piano set gets off to a cracking start with the exceptional latitude and rhythmic elasticity of Arensky’s 1891 rubato-rich Mozart K396 Fantasie. The fabled 1895 Josef Hofmann cylinders are here, only one of which – the Wagner-Brassin – he recorded commercially. Anna Essipova was briefly Leschetitzky’s wife and only left behind piano rolls. Her Godard is faint but valuable. Paul Pabst however is a notch above. He died in 1897 in his early forties and didn’t record. Composer, teacher and virtuoso, these eight performances constitute a magnificent reclamation from the embers. One can appreciate the dynamic variance of his arrangement of the Minute Waltz just as one can the refined lyricism of his Schumann as well as the dynamic virtuosity alternating with dazzling filigree in his Chopin-Pabst Mazurka in D. As throughout’ there are auditors’ hurrahs to end one or two of his performances. This is a major piece of work. There is a long sequence played by Arensky between 1892-99, some unidentified. He plays three of his Morceaux Charactéristiques Op.36 valuably – No.3 is particularly lovely in his performance. Sandra Droucker didn’t record so, as with Essipova, this is an invaluable retrieval and was recorded very early in her career. She was only twenty-two. Egon Petri’s cylinders were recorded in Vevey much later in 1923. One is an improvisation, Bachian, and the other three are unidentified. Leonid Kreutzer is more of a known quantity but these three pieces were recorded early, during the First World War; his discs followed considerably later. The second disc carries on the Piano theme. There is a series of double acts. Kreutzer joins with Paul Juon for Juon’s spirited Tanzrhythmen. Then Taneyev and Leo Conus – it’s really like Fantasy Football writing these musicians’ names - join forces for the latter’s Suite for Piano, four hands, four minutes here in total. Four and a half minutes is pretty much the longest track in this set of course, given the restrictions of the system. Then Taneyev and Pabst have a go in 1892. The piece; extracts from Arensky’s Suite No.2. There is understandable pitch wobbling in the first, Le Savant, but this is a fascinating document of intimate music making. The next section is devoted to string players. Jules Conus is now known to be the first violinist to have recorded. Born in 1869 he essays Bach, Sarasate and the Chopin-Sarasate Nocturne. His Bach is, like Arensky’s Mozart, very free rhythmically, leading one to all sorts of speculations about performance practice in the last quarter of the nineteenth century. His Chopin, with Paul Juon at the piano, is very pure with no gauche portamenti or finger position changes. Next an incredible rarity – Arensky, violinist Jan Hřímalý and cellist Anatoly Brandukov, playing extracts from Arensky’s own D minor Trio. Amazing! It’s a shame that the cellist – a fine musician – is heard better than the great expatriate Czech fiddler Hřímalý, who taught Jules Conus as well as a host of other Russian players, and played in the premieres of Tchaikovsky’s Piano Trio and Second and Third Quartets. No recordings existed – until now. You can hear some beautifully floated tone from him though – just – as well as Arensky really digging in to the scherzo. Next we reach Heifetz in November 1912 just after he had first recorded commercially the previous year. A veteran then of eleven, he plays a series of things he never returned to in the studio – Cui (Kaleidoscope, twice), Mozart-Auer, Popper-Auer and Kreisler. This last is especially valuable, as the touring Kreisler had just heard Heifetz in Russia. We also hear Heifetz’s confident treble, talking. Many of the cylinders are either introduced or otherwise have spoken contributions; not all certainly but many, such as some of these Heifetz ones. Next we have Eddy Brown, splendid fiddler and bastion of American Columbia and Royale 78s. These 1914 discs though well pre-date those. Most he did later go on to record but it’s a delight to hear this unaffected and brilliant musician at the age of nineteen. We can also hear his strongly accented German speaking voice. It’s a shame that the Press Brothers’ cylinder is in poor shape; it gets better though. The sole Choral record is by the Choir of the Synodical School of Moscow but it’s very distant indeed and was one of the two to be presented to Ward Marston via a cassette recording – it must have been very difficult for Block to record it anyway. Disc three is Vocal. Mademoiselle Nikita was the American soprano Louisa Margaret Nicholson and splendid she is. Her coloratura includes an amazing trill in Donizetti and she was clearly a big talent but an accident in 1897 ended her career. The first Bizet recording was made by Adele Borghi in 1891 – there’s chuffing on this one and it’s difficult to hear the piano at all. Nothing at all is known about Eugenia Jurjevna Werdan, not even dates of birth and death. Nikolai Figner is here but only with one faint and brief song by Cui. Maria Ivanovna Gautheil was recorded in a lecture hall and the resultant wide acoustic is unusual in the context of these generally more intimate surroundings. She makes a vital sound, more imposing than the more sedentary Werdan. One of high points of the third disc is Lavrentii Donskoi’s singing of Rubinstein. The husband and wide team of Evgeny Dolinin and Therésè Leschetizkaya-Dolinina (she was the daughter of Theodor Leschetitzky) make a good impression. Unfortunately one of Elizaveta Lavrovskaya’s cylinders – an unidentified piece - is rough. We are very fortunate though to hear four minutes of Elena Gerhardt and Arthur Nikisch, recorded in Grunewald in 1911; they didn’t record Brahms’s Blinde Kuh, so this is a vital survivor. The final small sequence is devoted to Spoken Word; Gerhardt and Nikisch (ninety four seconds) and then Leo Tolstoy from 1895 for over four minutes and then his immediate family from the same year (wife) and 1927 – his daughter and granddaughter. Finally that intriguing Tchaikovsky cylinder. This then is simply an extraordinary archive. And it’s difficult to overstate, notwithstanding the relatively primitive sound quality, just how astonishing it all is. Composers, instrumentalists, singers, Tolstoy. And the large majority recorded before 1898. As befits a set such as this the booklet is outstandingly produced with full biographies, explanatory details, photographs, cylinder announcements, translations, and transcriptions; details of each cylinder; details of recording locations and dates. It’s impossible to imagine this being done better. I’ve regularly singled out this company for praise and I might be thought to be talking Marston up. But when they produce such things as this, with such care, painstaking restoration work and research, then no praise can be too high. Everyone - laymen, specialist collectors, researchers and libraries included - is forever in their debt. 2 This cylinder is not part of the collection at the Pushkin House. This track comes from a cylinder in the possession of the Antique Phonograph Monthly. Based on Block’s catalogue of cylinders, the “Phonogrammothek” this cylinder could be numbers 39, 40, or 41. 3 This cylinder does not contain an announcement and a date was not provided by the Institute of Russian Literature. The date indicated is based on the findings of P.E. Veidman, in her article, “P.I. Tchaikovsky. The Forgotten and the New” from “Vol. 2 Almanac” Tchaikovsky House-Museum in Klin. 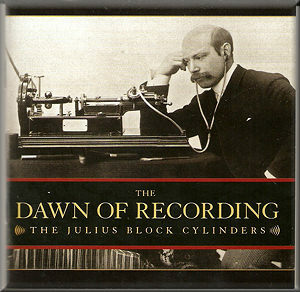 † Only known recordings by this artist, although additional Block cylinders may exist.